A disgusted dad has slammed an Australian supermarket after bakers allegedly ruined his son's frog-themed birthday cake with their 'pathetic' decorating skills. 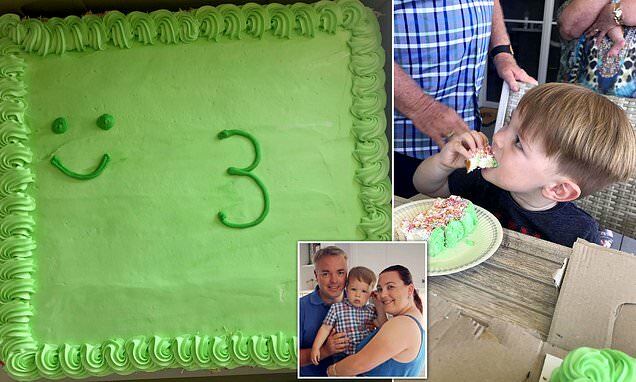 In preparation for his son Mason's third birthday, Shane Hallford, 43, claims to have forked out $49 on a special birthday cake from his local Woolworths store in Tamworth, New South Wales, on November 11. The dad-of-two claims his request for a frog-themed birthday cake was confirmed by the store three days prior to picking it up – but the policeman and his wife Amy, 29, were both horrified to discover that their son's cake looked 'nothing' like what they ordered. 'They told me it could be done, no worries at all. He wrote down everything I said and said it would be ready by Sunday morning. I was very excited to see it,' Mr Hallford said. 'I went down to pick it up on the morning of Mason's birthday party. I was in a rush getting extra supplies and didn't actually check it at the store because it was in a huge box,' he added. Instead of a colourful number three and a big green frog decoration they had envisioned, the 'mortified' parents were met with a 'pathetic' smiley face and small 'three' both written in green icing.